Specifically designed to make cutting frustration-free for left-handed children, our Softgrip® Left-handed Pointed-tip Kids Scissors give lefties a scissors that’s safe and comfortable to use with a blade tip design that offers excellent cutting control. Very good used for Kids scrapbooking, sewing and other DIY projects, Great for making models. We will try our best to reduce the risk of the custom duties. Color: Random. We will do our best to help you to resolve your problems. 600x Rubber Bands. - Rainbow loom bands is the bracelet making kit that's taking the world by storm! 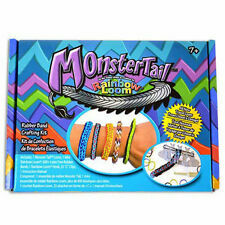 - Great gift for children, friends or yourself, super fun rubber band bracelet making kit. - Material: Rubber. Use:Kids Craft Puzzle. Color:Mixed Color. These fantastic S Clips will make a great compliment to your colourful S clips are usually used to finish woven bands off with a neat and tidy look. Package contains: Pack of 125 Colorful S-Clips Brand Unbranded MPN Does not apply UPC 4894462910313.